The software industry is growing and the need for developers is not slowing down. The barrier for entry into the software development field is relatively low. 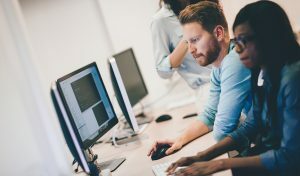 Colleges and code schools are graduating fresh developers every day, but what happens after that? As a developer, how do you go from good to great? How do you keep your skills sharp and current? There are certainly many things you can do, but we’ll explore 8 things anyone can do to ensure that they stay at the top of their game. Michael Ibarra has been developing software and building development teams in the Seattle area for the last 20 years. He leads the Seattle Software Craftsmanship meetup, an organization whose goal is to provide a safe and vibrant community where developers of all types can come together to learn, share and grow as software professionals. He’s shared many times at local meetups and conferences on technical skills like software design and development, TDD and Pair Programming as well as other skills like communication and career development. As Principal Consultant and Technology Evangelist at AIM Consulting, his role is to help spread a culture of technical excellence and continuous improvement.